We're headed to the beach next week with my parents, and I already brainstorming what I am going to bring. Of course a swimsuit and sunscreen are making the list, but there are a few other items I am thinking I need. See below for a few of my beach essentials. ONE Stay out of the sun in style with this striped beach umbrella. // TWO This straw sun hat will easily fold up in your beach bag. // THREE Get a little sunburned? Use this lotion to sooth your parched skin. // FOUR Protect your skin from damaging rays and breakouts with this oil-free sunscreen. // FIVE These slip-on espadrilles will go from beach to dinner. // SIX This pineapple printed cover-up can double as a blouse once you're back home. // SEVEN Throw on this shorts after a long day at the beach. // EIGHT These clear sunglasses will go with almost everything. // NINE You can never go wrong with a classic black swimsuit. 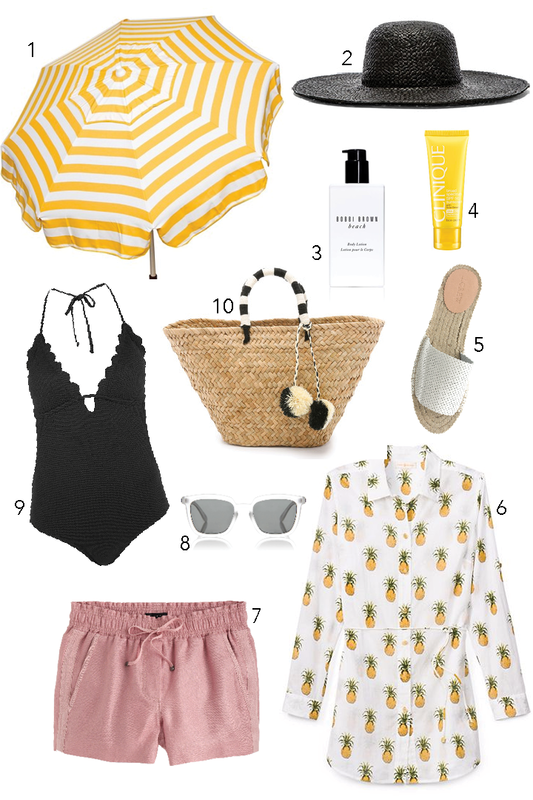 // TEN Store all of your beach essentials in this cute beach tote.